We spoke briefly with art critic Gabriel Kendra about his critical practice as well as his obsession with artist Matthew Lacker’s Ten-Second Sculptures, four of which are featured alongside Kendra’s analyses in the latest Meekling Review. Lacker’s analysis of Kendra’s $33,224,369.98 was featured previously on the blog. From Matthew Lacker’s lecture on Gabriel Kendra’s Ten-Second Sculptures at the NeoFuturarium, September 21, 2017. What first drew you to Gabriel Kendra’s work? And please, tell us more about his Ten Second-Sculptures in relation to his larger body of work. His larger body of work–at least as far as I have seen–seems to focus on living a life that produces a constant stream of actions, objects, events, performances, structures, and thoughts that each individually could be construed as artworks. When I first encountered it I was fascinated by the way that art can be made so readily and so freely, it’s almost too good to be true. Whether it’s hitting a snooze button or swiping a metro-card I can sense that artful intent is present. I also feel that this artful intent is eager to be researched, developed, produced, market, financed, and distributed, which admittedly is the extent of my involvement with it. I’m curious about your passion for non-glossy finishes. What else are you passionate about, Matthew Lacker? When I was younger strangers would often confuse me with “Matte Lacquer” which is the matte version of a liquid made of shellac dissolved in alcohol, or of synthetic substances, that dries to form a hard protective coating for wood, metal, etc… As a child I was fascinated that another Matt Lacker existed, and I guess my fascination just grew from there. Is art history/criticism your usual metier? No, actually. I began as someone interested in the creation of art but found that it was not my forte. I lacked the panache, both technically and conceptually to compete in the mêlée that is the modern art world and ultimately felt that I was just a poseur with a Papier-mâché facade. Perhaps it is a faux pas to admit such personal failings, but now it is a fait accompli. I think I have evolved beyond the gaffe of my earlier career, and have become a creative entrepreneur of sorts, a generalist where each task is an hors d’œuvre which combine into an overall joie de vivre. I do not primarily dabble in art history or critique but it is one of my intellectual ac·cou·tre·ments. A knot in my macramé of pursuits I suppose. Do you know if Kendra is constructing more 10-Second Sculptures in response to these politically fraught times? If so, can you disclose any hints as to what they might involve? I am sure he is. As far as I am aware Kendra is in a near perpetual state of performing actions and identifying objects that have profound political and cultural resonance. He often does not speak candidly as to their meaning–I will have to take time out soon to examine them for significance. Matthew Lacker is passionate about non-glossy finishes. Gabriel Kendra is from Richmond, Virginia, and a graduate of VCUArts, currently living in Chicago and occasionally making zines. We’ve been toiling behind the scenes for a while now — for over a year! — searching far and wide for assortment of fevered dreams and absurdities, heartbreaks and betrayals in order to collect and bring them together here in the freshest of compendiums, The Meekling Review. And we’re thrilled to announce that at last it’s here! 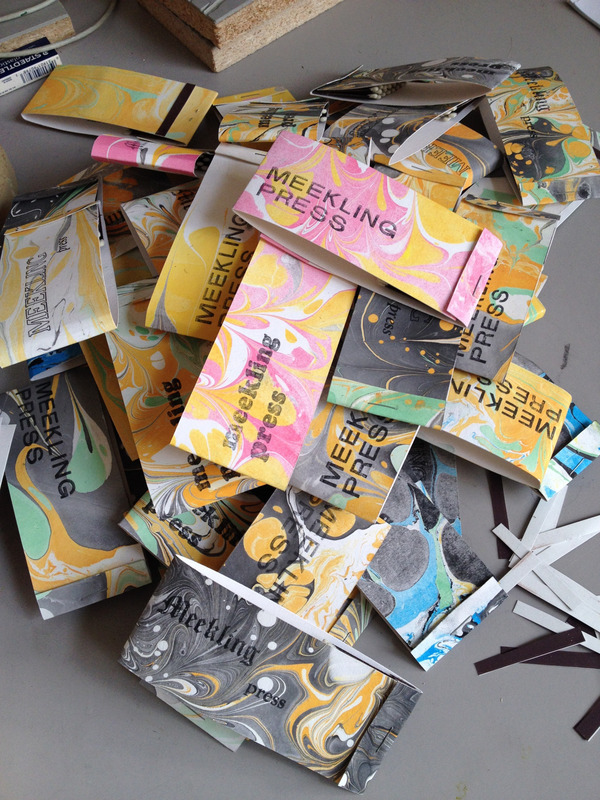 Ah, a Review — we imagine you’re thinking–so Meekling is launching a literary journal? The answer is yes — but mostly no. This issue, No. SZQ.645π, is the first and the last, the alpha and omega. Or maybe it’s easiest to say The Meekling Review is a slice from a one-off pie in the sky. Or something like that. Drawing inspiration from Pataphysics and Dada — we aspired to turn the seriousness of literary criticism on its head and transform it into something more clever, playful, absurd. How did we do? What did we realize? Anything? Nothing? You’ll have to look inside. The Meekling Review filled with meaty ads and a prose poem about the performances of self, psycomagic-inspired tarot readings, symbolic logic magic, a catalog of opening paragraphs, a series of images and their artistic analysis, studies on rat habitats, and a alternative taxonomies of a distinguished literary oeuvre. 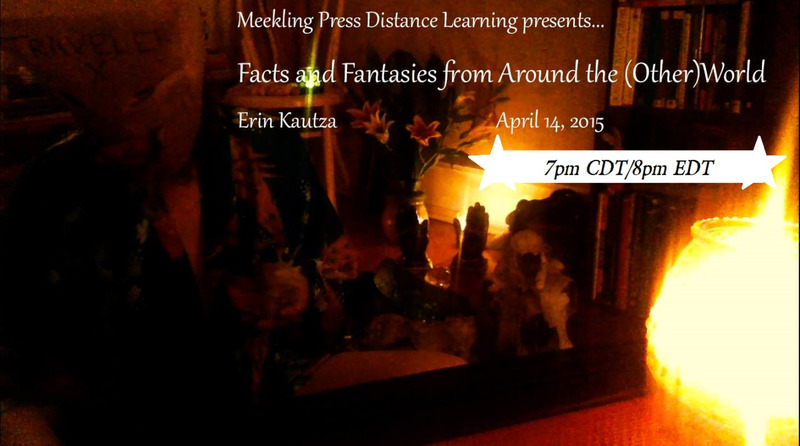 We plan in the coming weeks to bring you excerpts and author interviews…. 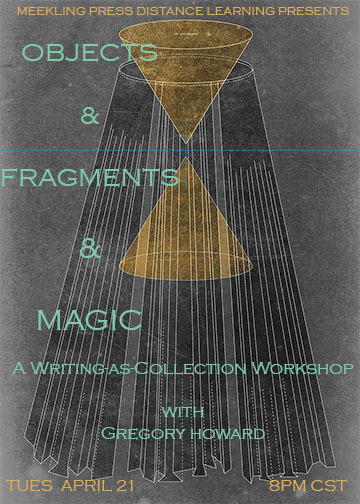 In this session Greg Howard leads workshop on Writing-as-Collection, which will include reading from his work and strategies for writing-as-collection, with bonus exercises to complete before and during. Gregory Howard teaches creative writing, contemporary literature, and film studies at the University of Maine. His first novel Hospice has just been released by FC2. He lives in Bangor, Maine with his wife and cats. Spend a part of your day or week collecting objects. For our purposes here, let’s define objects broadly–not just literal objects like things you find on the street, in your room, in a friends room, but also perceptions, memories, ideas, sentences or lines from work. Basically collect anything that fascinates you are captures your fancy. Now make a list. Be specific in your list. The fabric of your language is important here. Don’t just write “the photograph.” Write instead: “the photograph of the vacation in which the girl, who wearing a green one-piece swimsuit with golden fish on it, looks bored while being entertained by a street magician who looks malevolent and possibly drunk.” In other words, describe your objects well. Write a short narrative based around your list (250 words). Use the actual language of your list. Benjamin Franklin, printing his newspaper “Franklin the printer” by Charles E. Mills – Library of Congress reproduction # LC-USZC4-7217 . Letterpress printing is basically using a press to print raised type and images. Traditionally, this is done with movable type, a technology that started in the west with Gutenberg in the 1440s, and around 400 years earlier than that in China – each letter is a piece of metal or wood, arranged together to make words, sentences, paragraphs. Even the white space between words and lines has to be accounted for with a little piece of metal (slightly under type high*, so it won’t ink & print). In the late 19th Century, commercial printers and newspapers moved away from hand-set type to linotype, in which entire lines of type are cast from hot metal using a linotype machine – much faster than setting them letter by letter! It wasn’t until the 1960s and 70s that newspapers moved from letterpress printing to offset lithography and digital typesetting. We do most of our letterpress printing with hand-set type and linoleum cuts, but sometimes we’ll also take advantage the new high-tech letterpress method in wide use today of photopolymer plates – where a plastic plate is made from a computer file and then mounted on a base and printed on the press. We used polymer plates to print the covers of On the Stairs, for example. The industrialization of printing. Compare this photograph to the artist’s rendition of a serene Benjamin Franklin at the beginning of this post. “Fitzwilliam Press Room 1917” photograph by Covert via LSU Digital Library, Louisiana State Museum . We don’t have a motor for our press – instead we use a treadle to power it by foot, which is a great workout, and probably makes us really good at biking or kicking. When a design calls for more than one color, the colors have to be printed one at a time, the press cleaned off and re-inked for each new color, and the paper fed through again, by hand. It’s a slow process, and meticulous, but I find it totally addicting & wonderful, a tactile expression of something abstract as language, thought, poetry. Posted on April 16, 2015 May 9, 2015 Author meeklingpressCategories UncategorizedLeave a comment on What is Letterpress? Some kids, some ladies, some purposeful lurkers and a very special guest bring you cold, hard facts and pure raucous chimeras from this realm and others. 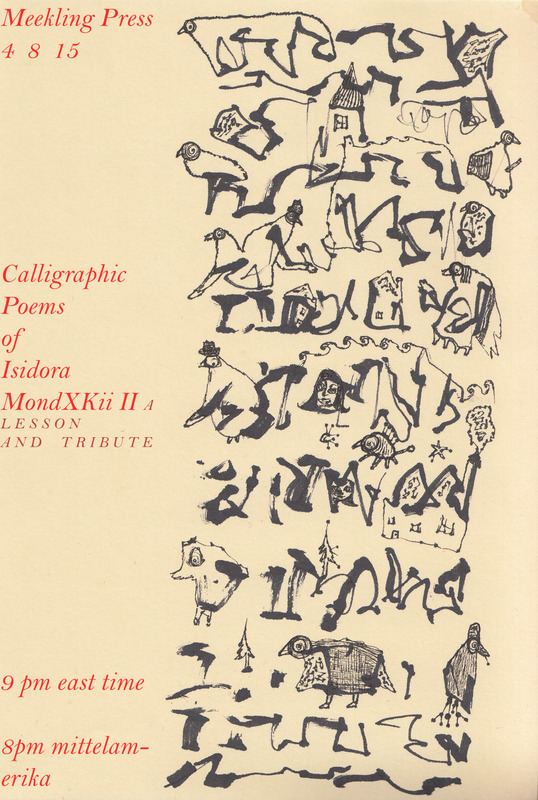 Dan Ivec will wear the mask of Aaron Octavio MondXKii in order to discuss at length the calligraphic poetry of his cousin, Isidora MondXKii II. Her work exists in a basically dead language which was read and spoken in certain, vast cities on the moon. Primary sources – original manuscripts and photographs – will definitely be discussed.